The leading independent specialist for windscreen replacement and windscreen repair based in Peterborough and serving all of the Peterborough area. National Windscreens Peterborough fitting centre provides windscreen replacement and windscreen repair services to businesses and individuals throughout Peterborough and the Peterborough area. 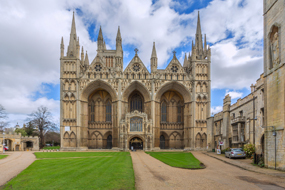 The city of Peterborough, situated in Cambridgeshire in the East Midlands, boasts one of the finest cathedrals in England whose origins can be traced back more than 1350 years. Peterborough is also home to a beautiful museum that has been recently restored, as well as numerous other cultural visitor attractions. The city is served by the A1139 and is close to the A1(M) which links Peterborough to nearby Cambridge in the south of the county. A direct train route means London can be reached in under an hour, making Peterborough popular with commuters. The Peterborough windscreen fitting centre and its mobile vehicle glass technicians service the needs of Peterborough and the surrounding area including Grantham, Huntingdon, Stamford and Ramsey. With 108 fitting centres and over 800 mobile technicians, National Windscreens operates the UK's largest windscreen repair and windscreen replacement network. The company provides low cost, high quality windscreen replacement and windscreen repair from its Peterborough fitting centre 24 hours a day, 7 days a week, 365 days a year. Repair and replacement of all types of vehicle glass including windscreens, rear windows and side windows is undertaken throughout Peterborough and all of the Peterborough area.